The minute you step into T.J.'s Pub in Manistee, you instantly fall in love with the cozy surroundings...and somehow you just know it's going to be a great experience. T.J.'s is located in the lower level of the Ramsdell Inn, one of the oldest buildings in the Victorian port city of Manistee. Recognizing that the lower level would make a great pub, T.J.'s became one of the best spots in Michigan to enjoy a drink or light meal. Meet friends at the bar, or have a quiet dinner by the fire. 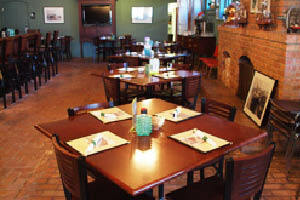 The atmosphere is unmatched...and the food will keep you coming back. 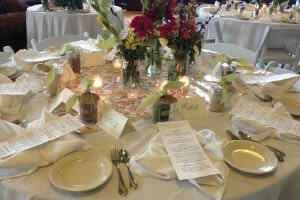 T.J.'s believes that fresh is best, and they pride themselves on using local produce from area farmers. The variety of fruits and vegetables here in West Michigan gives the diner great options from T.J.s menu. Begin your meal with a hot, homemade soup like Porter's Prime or Soup de Jour. The starters at T.J.'s Pub are simply delicious. Try their Local Platter which consists of Dublin Store sausage, local cheese, and seasonal fruit. The homemade meatballs are served on a mini baguette and are unique to T.J.'s. Other choices include Spinach Dip, Grilled Quesadillas, and Tasty Tamales. Fresh, crispy salads taste so good, and T.J.'s Pub serves more than just the traditional garden salad. Spicy Buffalo, Go Greek, and Cool Cali are just a few of the choices...and all salads can be rolled into a wrap. Sandwiches have a "wordly" touch--with delicious items like The Germania (sliced turkey and sauerkraut), The Tuscana (basil pesto spread on toasted ciabatta with roasted turkey, tomato, and our five-cheese blend), and The Americana (sliced prime rib topped with sauteed onions and mellow cheddar). Everyone's all-time favorite food is pizza, and T.J.'s Pub doesn't disappoint. Pesto, BBQ Chicken, Margherita, and Build Your Own are all served on a thin and crispy crust that just tastes better than traditional pizzas. They also offer scrumptious and unique gluten-free pizza. You can't go wrong with the menu at T.J's Pub of Manistee--a destination restaurant worth the drive from anywhere! T.J.'s features 12 pulls of tap beer...all Michigan craft beers. They also serve house wines, so whether you prefer sweet, white, or red...you'll find one that will complement your meal perfectly. T.J.'s Pub has a bar staff that can expertly fix you your favorite mixed drink--or try something new and exotic and find a new favorite! You will love the dim, cozy atmosphere (it feels like a real pub) and will enjoy coming to T.J.'s Pub on a regular basis. 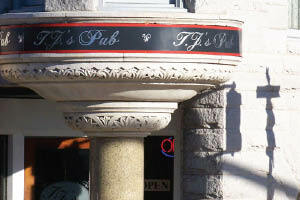 T.J.s Pub is located in the heart of downtown Manistee, in the lower level of the Ramsdell Inn. They are open Monday-Saturday at 11:00am. Open Sundays. It's time to meet your friends, family, and loved ones at T.J.'s Pub of Manistee--great atmosphere, delicious food, and affordable prices.